Tony Moreno had just regained consciousness from a near coma and was not in a condition to voluntarily waive his rights when police took a confession about 14 hours after he is accused of killing his son, his attorney said Monday during arguments about whether jurors should hear Moreno's hospital-bed statements. Moreno, 23, is accused of throwing his 7-month-old son Aaden off the Arrigoni Bridge in July 2015. He faces charges of murder and risk of injury to a child when his trial begins Friday in Superior Court. Police say Moreno had called his mother from the bridge and asked her to retrieve the boy's stroller and a phone with pictures of Aaden on it. His mother called police, and after she and officers arrived on the bridge, Moreno jumped off. He was badly injured and was hospitalized for several days. Pretrial hearings have focused on Moreno's statements to police in the hours after the baby was reported missing. Attorney Norman A. Pattis filed a motion to suppress those statements to police. He says the statements are inadmissible evidence because police took advantage of his medicated condition and did not properly read Moreno his rights or make sure he fully understood them. "The police, by their own actions, transformed the hospital room into a jail cell," Pattis said. Judge Elpedio N. Vitale is expected to rule by Friday on whether Moreno's statements to police can be heard by the jury. 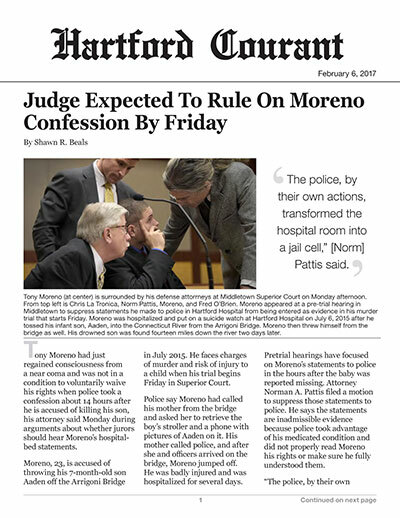 Pattis has argued that police, who had an officer stationed at Moreno's bedside to notify the detective bureau when Moreno was able to speak, essentially had Moreno in custody despite not charging him with a crime until a few days later. He said because of the medication Moreno was on and the injuries he suffered, he was not capable of making the complex judgment to waive his right to remain silent. He said a subsequent interview with a psychiatrist witnessed by a police officer should also not be admitted into evidence because Moreno was not medically capable of determining that the interview should have been confidential. Middletown Det. Dane Semper videotaped his interview with Moreno not long after Moreno had first regained consciousness in the hospital. Semper said during testimony last week that he read Moreno his rights, but another officer in the room had difficulty operating the camera so portions of the interview were not recorded. State laws require interviews in certain criminal cases — like murders — to be taped, depending on where the interview is held. A hospital is not explicitly named as a location that requires a recording. "Hospital interrogations are nothing new, it's not something that's never been thought of before," said Peter McShane, the prosecutor in the case. "The legislature certainly could have put that in the statute." Two video clips of Semper speaking with Moreno in the hospital were played in court last week. The first video clip is short and ends after Moreno asks Semper to turn off the camera. The video is clear and Semper's questions can be easily heard. After being asked to stop recording, Semper moved the camera to a table just outside the hospital room, but turned it back on and pointed it at Moreno's bed from the hallway. In the second clip, very little is audible, but Semper and Moreno can be seen interacting in the video, Moreno responding to Semper's questions and gestures with short replies, shrugs and nods. In the video, Moreno is wearing a neck brace and has an oxygen tube under his nose. His eyes are swollen shut and he has IV tubes coming out of his arm. Moreno was medically restrained during his recovery because he was put on a suicide watch and was intubated, witnesses said during testimony. "Whether or not the defendant was free to leave, that's not something the police put in place," McShane said. Vitale on Monday ruled that the jury will be able to view an autopsy photo as evidence related to expected testimony from an official in the state medical examiner's office. The jury will not see photos taken by state police of the baby's body when it was found 14 miles downstream in East Haddam. Vitale allowed a short clip of an 18-minute recording of police radio activity after the initial 9-1-1 call about the incident. He said the rest of the recording and other photos are not relevant to the circumstances of Aaden's death. Moreno faces a maximum of 70 years in prison.